I recently wrote down my vision for our home and went into great detail. Being as specific as possible is the only way to reach a specific result. My husband and I are both seriously interested in entertaining more, in hosting parties and simply having company over. We are very relational people and love conversing with others. I’ve always dreamed of having frequent guests and parties, but because of our crowded living situation through the years, have struggled to make that happen. A nice guest room is a big priority for me, as we sometimes have friends and family come in from out of town. I’d like to be able to offer comfortable accommodations in which guests can feel right at home. I’d like to be able to say, “Mi casa es tu casa,” and really mean it! I would like to set up a mini recording studio so I can finally pursue my music seriously. A dream of mine is that I can write and record songs in my own home and send them out into the world. My main interest is songwriting, not performing, and in my wildest dreams, other people pay me to record and perform my songs. Having my own recording studio will allow me the freedom to pursue my music at my own pace and the ability to share my music with others. I would like a tidy and organized kitchen that inspires me to cook and bake with joy. My desire is to connect deeper with food and learn what my body truly wants instead of settling for quick and easy junk food. Because of my desire to entertain guests, I’d also like to get better at cooking for others and try more recipes. Being that I have many crafting hobbies, I’d like a space devoted to my creative pursuits. Having a tidy and organized craft space will give my creativity room to breathe and explore. I’d like to be able to quickly and easily access all my craft materials so my creative process is not frustrated and slowed down by searching for what I need. Having all materials and tools in one organized space will allow my creativity to flow with joy. The dining room table should NEVER be used for storage or as a dumping ground for homeless items! The table is primarily for eating, but also for the children’s schoolwork and craft projects. Organizing the dining room will help free the table of STUFF and allow it to be used for what it’s meant for. The table should be cleared and cleaned immediately after every meal and every activity so it’s ready for the next meal or project. I’d like a clean and tidy home so I can feel both relaxed and energized. 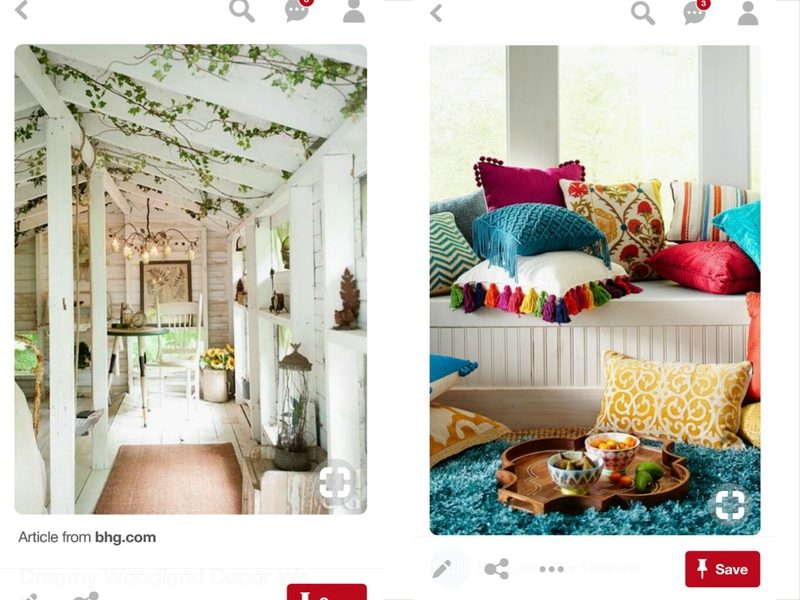 Light neutral walls and ceilings for a bright and relaxing atmosphere, and colorful decorations and accents to give me joy and spark creativity. At least one plant in every room… as many plants as I can manage! I’d like to incorporate as many natural elements in my home as possible so as to create a smooth transition from outside to inside. Nature is very important to me and I feel best the more connected to nature I am. These two pictures capture the idea of what I’m going for: the light space with natural elements and lots of bright colorful accents. There are many other desires I have for our home, but this is definitely a good place to start! Overall, I’d like my home to be a place of deep connection with myself, my family, and others.